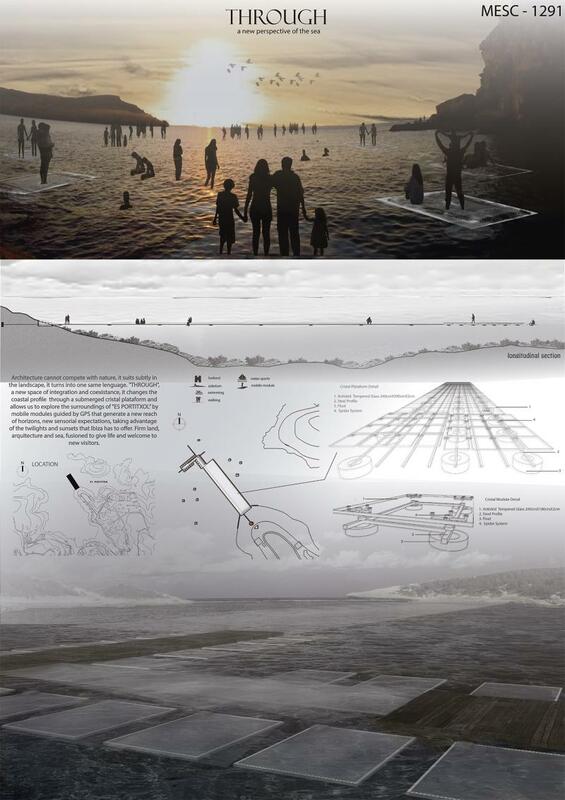 A new perspective of the sea, will become an interesting tourist attraction. Architecture cannot compete with nature, it suits subtly in the landscape, it turns into one same lenguage. "THROUGH", a new space of integration and coexistance, it changes the coastal profile through a submerged cristal plataform and allows us to explore the surroundings of "ES PORTITXOL by mobile modules guided by GPS that generate a new reach of horizons, new sensorial expectations, taking advantage of the twilights and sunsets that Ibiza has to offer. Firm land, arquitecture and sea, fusioned to give life and welcome to new visitors.